Pleomorphic adenoma in the parapharyngeal space either occurs de novo or as an extension from the deep lobe of the parotid gland. A rare synchronous occurrence of pleomorphic adenoma in the parapharyngeal space and submandibular gland of a 48-year-old Nigerian male is reported. Pleomorphic adenoma concurrent in the parapharyngeal space and submandibular gland is very rare. A complete surgical excision of both tumors is the treatment of choice. Pleomorphic adenoma (PA) is an epithelial tumor of complex morphology, possessing epithelial and myoepithelial elements being intermingled with mucoid, myxoid, or chondroid tissue arranged in a variety of patterns and embedded in a mucopolysaccharide stroma . It is the commonest benign tumor of salivary glands [2, 3], and accounts for 90% of all salivary gland tumors . The submandibular gland is the second most common site of pleomorphic adenoma after the parotid gland [2, 4]. It is also the most frequent benign tumor arising in submandibular gland [5, 6]. Pleomorphic adenomas in the parapharyngeal space (PPS) can arise either de novo or may arise in the deep lobe of the parotid gland and extend through the stylomandibular tunnel into the PPS . Tumors in the parapharyngeal space are rare and constitute less than 0.5% of head and neck neoplasm . Of these, PA is the commonest benign tumor (40%) [9, 10]. The origin of de novo PA is probably from displaced or aberrant salivary gland tissue within a lymph node . A Medline literature search did not reveal any reported cases of concurrent PA in the PPS and submandibular gland. A 42-year-old Nigerian male was referred to the outpatient clinic of the Oral and Maxillofacial Surgery Department of the Lagos University Teaching Hospital in May 2002 with a painless, slow growing recurrent left neck mass of 20 years, duration without any associated constitutional symptoms. There was no history of difficulty in swallowing. He had undergone surgical resection for the similar neck mass earlier in 1972 and 1982, which was diagnosed as pleomorphic adenoma. The patient gave a history of tuberculosis in 1973 and regular visit to the psychiatrist. Clinical examination revealed a firm non-tender multilobulated mass in the left submandibular region. The overlying skin appeared clinically normal with the incision scar of previous surgeries. Intra-oral examination revealed a firm non-tender bulge on the left parapharyngeal/tonsilar fossa. Bimanual palpation of the left parotid gland revealed no abnormalities. A provisional clinical diagnosis of pleomorphic adenoma or Warthin's tumor involving the left parapharyngeal space and submandibular gland was made. Incision biopsy of the submandibular discrete lobule confirmed the diagnosis pleomorphic adenoma. Computed tomographic (CT) scan could not be done, as the patient could not afford the cost, while magnetic resonance imaging (MRI) facilities are not available at our centre. The patient was subsequently admitted for surgical excision of the submandibular and parapharyngeal tumor. The submandibular lesion was approached through a left submandibular incision. The mass was found to be completely distinct from the parapharyngeal tumor, which was enucleated by blunt dissection. Recovery and immediate post-operative period were uneventful. On gross examination, the submandibular tumor consisted of multiple nodules of solid, well encapsulated masses ranging from 1 to 4 cm (figure 1). While the parapharyngeal mass measured 8 cm × 4 cm × 2 cm and was well encapsulated (figure 2). 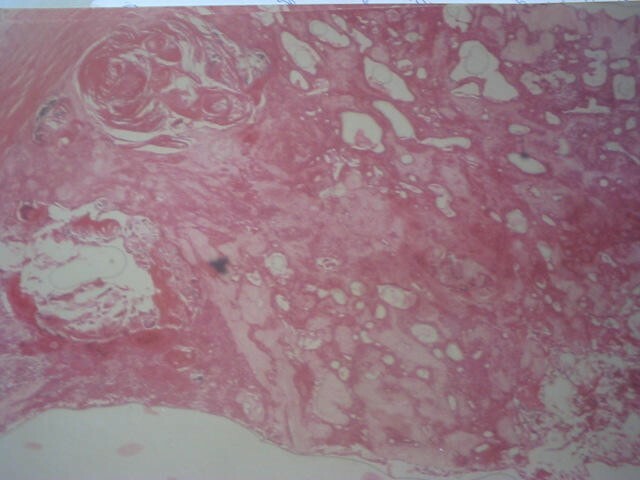 Histological examination confirmed the diagnosis of pleomorphic adenoma (figure 3 and figure 4). Both lesions exhibited dense fibrous connective tissue stroma in which sheets and nests of neoplastic epithelium and epithelial lined ductal structures containing eosinophilic coagulum were seen. Myoepithelial cells were seen in a myxochondroid area. These were more prominent in the parapharyngeal tumor. Both lesions also contained squamous metaplasia and keratin pearl formation. Myxoid areas were predominant in the submandibular tumor. 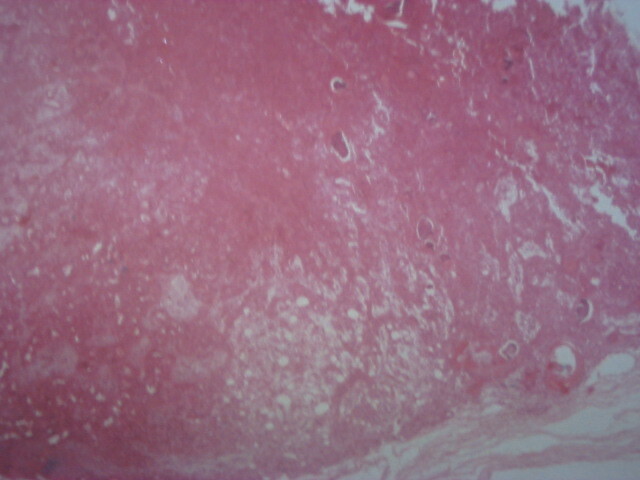 The stroma of the submandibular tumor showed hyalinization. There was no evidence of malignancy in any of the sections examined. 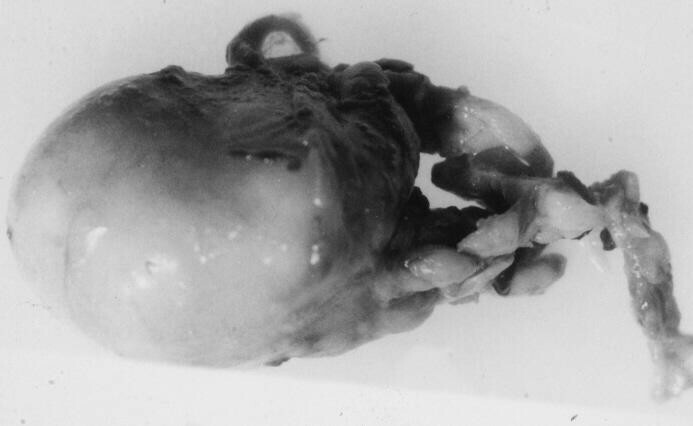 Surgical specimen of submandibular tumor consisting of multiple lobules of solid encapsulated masses. 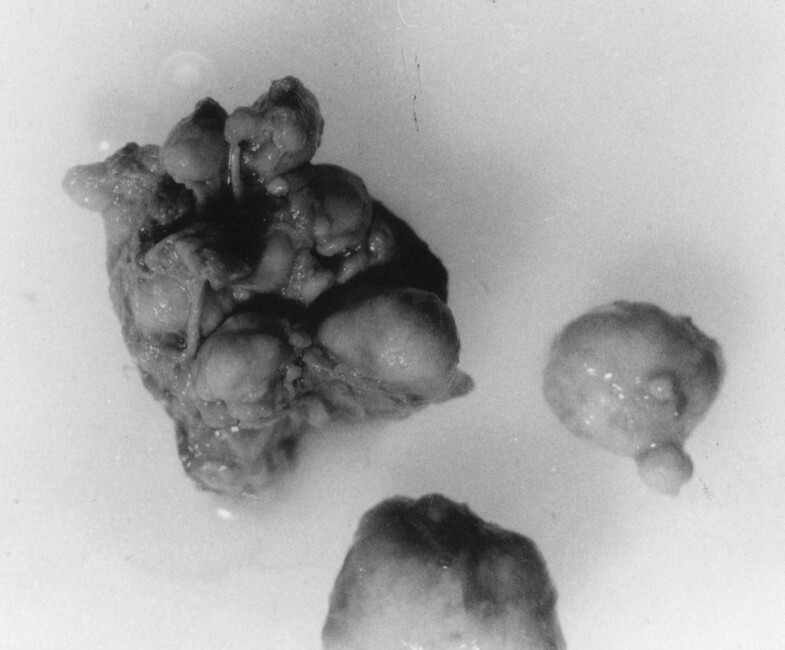 Surgical specimen of parapharyngeal tumor consisting of a well encapsulated solid mass. Photomicrograph of submandibular tumor showing islands and strands of neoplastic epithelium, areas of chondroid tissue and duct like structures containing eosinophilic coagulum (Hematoxylin and Eosin × 40). Photomicrograph of parapharyngeal tumor showing duct like structures, mucoid- chondroid structures and strands of neoplastic epithelium (Hematoxylin and Eosin × 40). Pleomorphic adenoma (PA) of the parapharyngeal space is rare. Simultaneous occurrence of pleomorphic adenoma in the submandibular gland and parapharyngeal space is even rarer. De novo occurrence of the parapharyngeal tumor in our patient from displaced or aberrant salivary gland tissue within a lymph node in the parapharyngeal space as suggested by Varghese et al. is a possibility. The parapharyngeal tumor might also have developed from seeding of the submandibular tumor to the parapharyngeal space during the earlier surgical interventions through the posterior part of the submandibular space, medial to the stylomandibular ligament . CT scan and magnetic resonance imaging (MRI) are important diagnostic tools in tumors of PPS. CT scan helps in determining the effect of disease on the surrounding structures, local spread, calcification in the tumor or hyperostosis and also to some extent in determining the type of tumor [11, 13]. Magnetic resonance imaging (MRI) has been shown to be superior to computed tomography in the investigation of parapharyngeal space tumors [13–15]. The magnetic resonance imaging has the great advantage of direct, three-plane imaging which helps to show the position and extent of the tumor prior to surgery or radiotherapy as well as better soft-tissue demonstration of skull base involvement . The vessels are clearly demonstrated due to the absence of signal from flowing blood, so that displacements can be appreciated without using contrast medium. Since internal carotid artery is more consistently identified on MR images than it is on CT scans, in most instances the likely histology of a tumor in the parapharyngeal region can be inferred from vessel displacement [13, 14]. A final advantage of MRI over CT scan is the multisection capability of MRI, which reduces the patient scanning time and at the same time allows wide coverage of the area of tumor involvement . The possibility of leaving behind clinically undetectable tumor is very high due to our inability to obtain CT scan and MRI prior to surgery and hence the chances of recurrence are high. Fine-needle aspiration cytology (FNAC) is the modality of choice for obtaining biopsy sample for PA , which was not carried out in this case. If performed, the incision biopsy could have been avoided. The biopsy incision scar on the skin was however, included in the subsequent surgical excision specimen. However, it is to be emphasized that the incision biopsy is no more advocated for salivary gland tumors due to the risk of tumor seeding and subsequent multinodular recurrence [7, 16], as was seen in the present case. The treatment of pleomorphic adenoma is essentially surgical excision [7–9, 11]. The excision of submandibular pleomorphic adenoma is usually straight forward with little or no complications due to direct surgical access. The parapharyngeal space is however, a complex anatomic region located between the mandibular ramus and the lateral pharynx and extending as an inverted pyramid from the skull base superiorly to the hyoid bone inferiorly . Within this potential space are cranial nerves IX, X, XI, and XII, the sympathetic chain, the carotid artery, the jugular vein and lymph nodes. Due to the PPS's anatomic complexity, location and surrounding vital structures, resection of tumors from this space can prove challenging to the head and neck surgeon. The approach of choice to the parapharyngeal space to allow adequate removal of the tumor should meet two criteria: wide intra-operative visibility for safe radical dissection and minimal functional or cosmetic after-effects . The presence of rigid bony vertical ramus of the mandible which forms the lateral wall of the parapharyngeal space prevents direct surgical access to this region . So a considerable number of surgical techniques have been described to overcome this problem: one involves anterior dislocation of the mandible by division of stylomandibular ligament and forward traction of the mandible , and the second involves mandibular osteotomies [19–21]. Types of mandibulotomy that have been described are: median, parasymphyseal, horizontal, inverted "L" and double mandibular osteotomy with coronoidectomy; with or without lip split [17, 19, 20]. In this patient, a cervical submandibular approach  was used to gain access to both the lesions. Although the visibility and access to the parapharyngeal space was poor with this approach, the tumor was easily mobilized by blunt dissection. However, this is not a recommended technique and the sharp dissection should be carried out as far as possible to prevent injury to the great vessels and cervical nerves and also to facilitate en bloc removal of tumor without possibility of seeding. If need arise the digastrics, stylohyoid, and styloglossus muscle and stylohyoid ligament can be removed for access . Although, the submandibular approach was found sufficient for the excision of both the submandibular and parapharyngeal tumor in the current case, this surgical approach is considered a shortcoming, as some authors have expressed concern about limited exposure, need for finger dissection, and poor vascular control at the skull base with this approach . Injury to nerves and vessels as well as bleeding from the base of the skull has also been reported to be more common with blunt dissection than with sharp dissection. It is our opinion that the approach should be individualized based on the size and extent of tumor, and the knowledge, skill and experience of the operative surgeon. Attempts have been made to classify pleomorphic adenoma as either epithelial/myoepithelial or myxo-chondroid predominant, based on the predominance of either epithelial/myoepithelial or mesenchyma-like tissue . Pleomorphic adenoma of the submandibular and PPS space in the present case, were epithelial/myoepithelial and myxoid predominant respectively. Malignant transformations in recurrent and large pleomorphic adenomas are known [22, 23]. Malignancy can arise from epithelial (carcinoma ex pleomorphic adenoma) or mesenchymal (true malignant mixed tumor) components . Metastasizing mixed tumor is the third sub-type of malignant mixed tumor, and develops from an otherwise unremarkable mixed tumor . The diagnosis of malignant mixed tumor requires the presence of a recognizable mixed tumor (primary or recurrent) in association with a carcinoma and/or sarcoma . The histological features that may consistently predict the development of metastases have not yet been identified . Serial histological sections in our case showed no evidence of malignant epithelial or mesenchymal components in association with both tumors in our patient. LAL conceived the study and coordinated the write-up and submission. AWL did the literature search and participated in the writing of the manuscript. AOF examined the biopsy and surgical specimens, reported the histopathological findings and classified the tumor. OMO and BBO wrote the case presentation and participated in the writing of the manuscript. All authors read and approved the final manuscript.